Feed Your Farm is a company comprised of multi-generational dairy farmers and hydroponic system designers, who have come together to create an indoor, controlled-environment sprouting system that produces high quality feed for a variety of livestock including dairy and beef cows, horses, sheep, pigs, goats, and chickens. For those that may initially be intimidated by this frontier of agriculture, we have designed a system that is cost-effective and easy to operate for anyone looking to feed fodder. Please explore our website to learn more about our offerings, or contact us to arrange a demonstration. Our system, which requires very little labor to operate, allows farm owners to have more control over their feed supply by providing them the opportunity to grow fresh, highly nutritious feed 365 days a year. Our system allows livestock owners to provide their animals with a stable, consistent ration that is fresh, nutritious, and loaded with beneficial enzymes. The amount of feed that can be produced in a 200 acre field can be produced in a 2,000 square foot fodder room. Our company is a unique blend of generational organic dairy farmers and hydroponic system designers who worked together on a 250-head organic dairy farm to build and perfect the most functional, farmer-friendly fodder system that any farmer could afford. We have the ability to set up interest-free in-house financing for those who qualify. 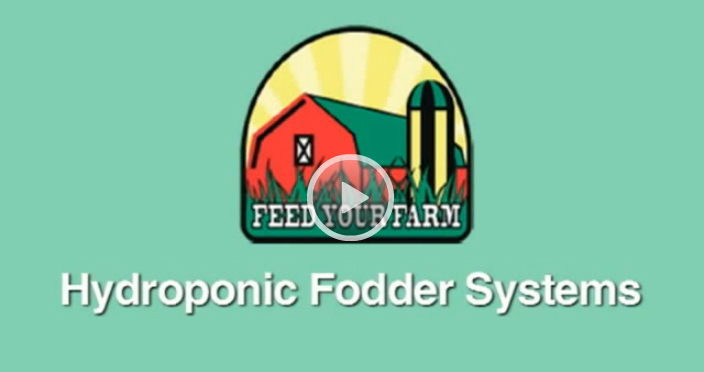 Hydroponic Fodder Systems | Feed Your Farm © 2019. All Rights Reserved.